I’m 6’4″ tall, 285# and I’m handicapped. I have a type of Muscular Dystrophy so I can’t stand in the Kayak like the website shows. I bought a Wave Walk kayak Basic model, plus the Wavewalk one piece paddle 9’8″ long. It’s a lot of money but being handicapped as I am, its worth every penny. I outfitted the kayak with pontoons. I only needed the pontoons as with my handicap, my balance is shot and even if I managed to stand up, it’d only be for 20 minutes before I’d have to sit down. It took about 10 days to receive the pontoons at a additional cost of $400. I took it out to a nearby lake for a test trial and everything worked. Several boat fishermen expressed an interest as they’d never seen anything like it. The big test came at Blackburn Point, Osprey, FL meeting up with my ole fishing buddy, Cath. It only took me a few minutes to assemble, fasten my basket on the front, stash my rods and push pole and away I went. I paddled with the pontoons down, leaning left and right testing it. It’s a solid fishing platform. To eliminate my stiff back, I grasp the gunnels and stood up bending over for a couple of minutes to stretch before sitting down again. You can also lie down as the seat is very long. It paddles just fine and tracks well with pontoons down. Once moving, I raised the pontoons out of the water to reduce the drag and made it easier to paddle. When you stop, a tug on the cords, down goes the pontoons to lock in place, drop an anchor and commence to fish. I love it and kayakers are taking notice of it. When I got back to the ramps as rain was coming, I slid all the way back, the bow comes up and I glide onto the shore. Pull myself to a standing position and step out of the kayak. Takes a couple of minutes to remove the pontoons, then the kayak will slide into any truck bed. I have a Ford Ranger with a 6 foot bed and a 2 foot tailgate so 3 feet hang out the back so I tie a red flag to it. There you have it. I have my Wave Walk with me if you want to check it out and even take it out for a spin. I’ve posted a Youtube video on me paddling it around. This is an ideal system for the handicapped fishermen with leg problems like me that have trouble getting in or out of a conventional kayak. Once I get where I’m going to fish then a tug on the ropes releases the outriggers and lock into place giving me a stable platform to fish from. I’ve had 4 foot wakes from passing yachts rock the kayak without a mishap. Reaching for a hooked fish doesn’t give me worry that the kayak will flip. It’s just peace of mind knowing the kayak is that stable. With the pontoons locked in the down position large wakes or choppy water doesn’t affect the performance. 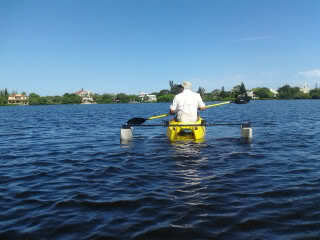 When I start to paddle, I can raise both pontoons out of the water to reduce drag. More good news for people with leg, knee and balance problems who want to fish without the hassle of owning a regular motorboat, and without the inconvenience, discomfort and potential hazard associated with other fishing kayaks. Nice setup. I have knee problems and that’s the only kayak I can sit in. 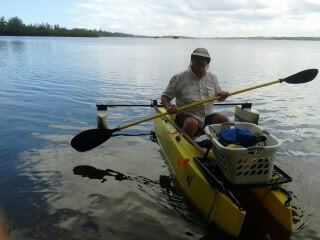 I was wandering why Harry had installed that big basket in the front of his kayak, instead of storing his fishing gear in the hulls, and then I realized that people like him who have leg problems, may not find it easy to reach down into the hulls. Good job!